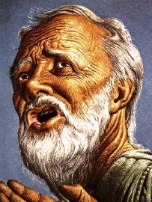 Abraham and Lot lived together on the same land and they both had flocks and herds. Lot was Abraham's nephew. 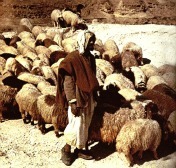 As their flocks and herds increased it became overcrowded, and there was fighting among their herdsmen. Lot saw the beauty of the land, but he didn’t consider the evil of the land; he had his tent face a city filled with evil. He was blinded by the beauty of Sodom and Gomorah - what a view! The Lord and 2 angels visited Abraham. The Lord and His angels were on their way to Sodom and Gomorah. 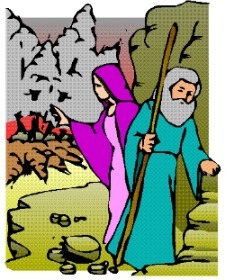 The Lord revealed to Abraham what He was planning to do. Abraham pleaded with God not to destroy the righteous with the wicked, because Lot was in Sodom. Abraham pleaded with God not to destroy the city if 50 righteous could be found. Abraham was then bold enough to negotiate the number with the Lord from 50 down to 45, to 30, to 20, and finally to 10. When the 2 angels got to Sodom Lot saw them and invited them into his house. Not only was Lot being hospitable he knew it wasn’t safe to be in the streets. 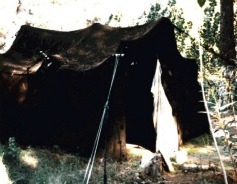 Note that Lot has moved from having his tent facing the city to living inside the city. Evil can be so attractive as to draw us in to it. Observe it long enough and it will appear normal to us. 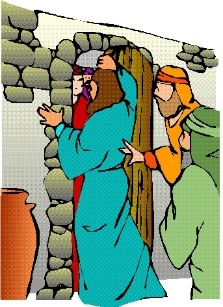 Lot tries to plead with the men not to be wicked, but they accuse him of judging them and threaten him. The angels had to save Lot. The men of Sodom were so determined in their wickedness that blindness couldn’t even stop them from their evil plan. They were so intent on doing evil that they were not concerned or alarmed that they could not see. Ten righteous people could not be found in Sodom, Lot tried to warn his sons-in-law, but they didn't believe him. Only 3 people were saved. Four left the city, but Lot's wife's heart was still in Sodom and she looked back at Sodom and was turned into a pillar of salt. Only Lot and his unmarried daughters were saved. Let us not be overcome with evil like the people in Sodom and Gomorah. We must guard the avenues of our soul. Guard what you see (eyes) and what you hear (ears), so that evil does not become acceptable. Decide if something is good or evil by the word of God and not by your own opinions.